Welcome to St. Augustine Lighthouse! As I mentioned yesterday, a brief meeting in St. Augustine, bracketed by flights in and out of Daytona Beach, FL left me with little time for sightseeing. I did manage to collect a bunch of photos that I will share at some point, but the highlight of my travel was touring the lighthouse in St. Augustine. I love lighthouses and this one is beautiful, well preserved and maintained, and includes a Light Keeper’s House and museum. It just doesn’t get any better. Since I have way too many photos to share in any one blog post, I culled out the photos with doors in them to share in Thursday Doors. Thursday Doors is a weekly gathering of the fleet of door aficionados from all over the world. Light Keeper, Norm Frampton lights the lamp Thursday morning and keeps it burning until noon Saturday. If you have a door to share, or just want to see some amazing doors, set sail for the official Thursday Doors lighthouse in Montreal. Once that’s in sight, look at Norm’s doors, then look for the blue frog. Click that tadpole to be guided safely into the harbor. The lighthouse is built with Alabama brick and, as you might have seen yesterday, iron stairs, railings and landings that were made in Philadelphia. The light is topped with a hand-blown, nine-foot-tall, Fresnel lens, that was constructed in Paris, France, and remains one of only a few such operating lenses in the United States. Standing guard over a coastline that is regularly subjected to high winds and punishing rain, the lighthouse had to be strong. That required strong doors and windows. As I stopped to catch my breath let others pass on my way up, I enjoyed a stiff cool breeze entering those windows. It occurred to me that, it wasn’t all that windy a day. But, the higher I climbed, the more the wind made its presence known. The light keepers home was a wonderful tour in and of itself. I will put together a post about that later, but I’m including the door photos here. I’ll stop yammering now, and offer the gallery of photos. Click on any one to begin a slide show. I have added captions to further explain some of the cool things that I saw on the tour. I was glad to find things like this to read on the way up. It gave me an excuse to rest. The view kept getting better. The windows are like little doors. I know, it’s a window, but it’s beautiful. This door is at the top of the stairs. It goes up to the lamp, but we weren’t allow to go up. I really like this piece. Curves like this aren’t easy to make today, I can only imagine how hard it was in the 1800’s. 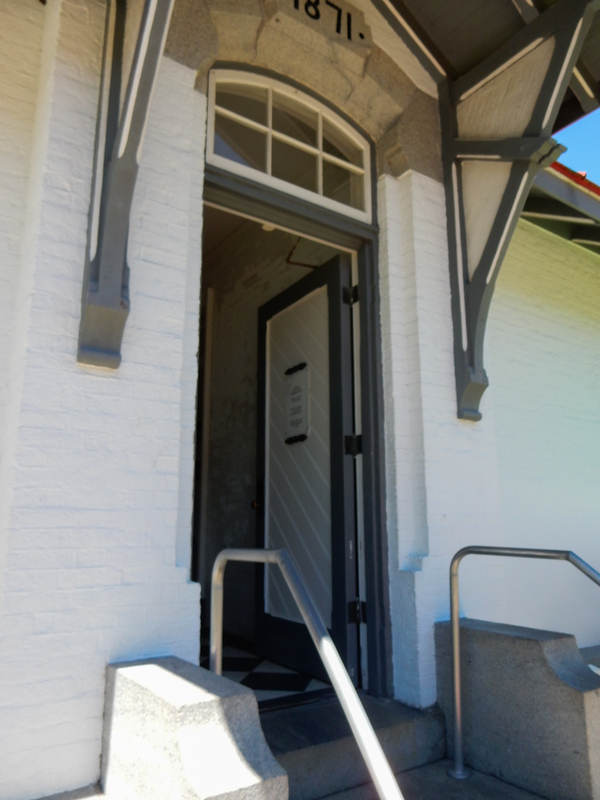 This door opens to the balcony that rings the lighthouse, about 8′ below the lamp. Front door of the lighthouse, on the way out. Entrance to the lightkeeper’s house. In the parlor of the lightkeeper’s house. Inside the lightkeeper’s house, Somewhat ordinary door. In the light keeper’s study. I like that the museum gave us a look at both sides of the door. OK, technically, it’s a lid, but, you know, door. St. Augustine Lighthouse. Sorry, I couldn’t get back any farther. What museum would be complete without a giftshop? The oldest city! That’s cool! Now, since you spotted the exterior “Z” on the cabinet, perhaps you can explain the hole in the top of the door? I’ll have to get back to you on that, Maggie. Thanks for stopping by, and I hope you have a great Thursday too. Thanks Judy. Maybe one of your excursions to escape the snow will take you farther south. You never can tell. Thanks Cheryl. If I get back to another Value Studio, I’ll see if I can’t stop at Ponce De Leon. That sounds very interesting. Great job for the oldest city’s lighthouse, Dan! The city should hire you to put together their next advertising campaign!! and as it should be!! Please keep these pictures coming! They are lovely! I have never heard of lighthouse until I read your post here. Thanks for the tour! I love lighthouses. In the past, we spent a day touring St. Augustine and made it to the the fort, but not the lighthouse. Florida history is the focus of 4th grade and we still lived there for 2 of our 3 children to have their end of the year field trip be to St. Augustine as well. Thanks. I would love to tour the fort. Maybe, if I get back. We (New England) tend to forget Florida’s history. Thanks. So many things to see. Some we have to get vicariously. This is why I love blogging – I learn something new (St Augustine is the oldest city in the US … I would NEVER have guessed that one!! ), and I get to experience someplace new through someone else’s camera lens. Thanks Joanne. I’m glad you enjoyed this. I was really admiring that cabinet. Knowing that it was all cut and joined by hand, and seeing that they did a better job than I might do with power tools! Maybe I need to add a round wall when I build out our 2nd floor. Ahem…..St Augustine and Pensacola, where I live, have an ongoing feud as to which is the oldest city. St Augustine is beautiful, though. My daughter went to Flagler College for a short while–I loved going there to visit her. The lighthouse is wonderful! Great post, Dan. Uh oh, didn’t mean to take sides, Lois. There are two town in CT that fight about which is CT’s “First Town” – both have it plastered on their welcome sign and both have an annual parade. St. Augustine is beautiful. How far are you from there? Ha! This is ongoing…who cares?! Both are beautiful towns. I am in the Panhandle so it is a straight shot east for about 6 hours. St Augustine at Christmas is a sight to behold. I keep forgetting the geography of FL. flat, flat and more flat. Lois, that sounds like Illinois. We want to Colorado several year ago and, Mary, I about drove off the road looking at all those mountains! Unbelievable. I was there on motorcycle, when still married. We were in Colorado Springs, Denver, Royal Gorge and Estes Park areas. I had the good fortune to be sitting on the back of the Harley, able to view the mountains and landscape without worrying about driving. It’s a beautiful state! Thanks Jean. It was a tough climb, but very interesting. Wow, I don’t think I ever heard that. That’s pretty cool. Thanks for adding to the discussion today! Thanks John. I’m glad you enjoyed this. I’ve been to St Augustine a couple of times, but this was the first time I got off the leash. Off leash is the way to go. Love it! I haven’t been to St. Augustine since I was a child, so I don’t really remember it. Now I could go up the stairs of a lighthouse and even out onto the walkway, although I’d probably be close to the building. But in those days, I couldn’t have done the stairs, at least if they were the metal, open kind. What a gorgeous light house! The only thing that threw me was the sign with the name. It’s in the plural (Keepers’) where I would have expect the singular (Keeper’s). Interesting. Thanks Janet. That sign threw me too, and I got it wrong in the post, but, ironically, I did give the answer. There were multiple light keepers living in that house up until 1955. The stairs were open, but the balcony was surrounded by a nice sturdy high wall. It was a very nice lighthouse to tour. After noticing it, I figured it was for all the keepers over the years, but I still think it’s a bit odd. :-) It’s a beautiful lighthouse. Excellent “Doors” post, Dan. When I was a child I always wanted to go to St. Augustine — it caught my imagination. I never got around to going though when I lived in the deep south. My first thought was “What a small door.” Immediately followed by, “With a lighthouse, it would need to be small!” Looking forward to the other photos. Have a thriving Thursday. Thanks so much Teagan. There were so many good things to see on this little tour. I love all that stuff. I hope you’re having a great day. What a boldly painted light house tower!That chess table is so cute, as well as the doors to that tiny library! and see you have done your exercise that day – I’m already huffing and puffin by a 100 steps! Wonder why it was named after Augustine… great post, Dan. Apparently, sailing from Spain, they first sighted land on the day of the Feast of St. Augustine. I love the little library, and I always enjoy seeing the historic woodworking pieces. Thanks for the comment. That makes sense -Augustine is one of my favorite people from history:) When I saw that library it reminded me of how spoiled we are today with an over-abundance of books we can buy (and I do!). It has survived many, do I guess it’s a safe place but I wouldn’t want to be hanging out near the top. It is beautiful. I’m glad you enjoyed this quick tour. I also love lighthouses and enjoyed your tour of this one, as I’ll probably never get to see it in person. I’m glad you enjoyed this. Thanks for the comment. Great arm-chair tour! I love that black line spiraling up the outside of the light’s tower. We don’t have any like that that I know of here. It looks great with the reddish roof. What a fabulous chest/armoir that black and white curved piece is! Thanks Deborah. I’m glad you enjoyed this. I love that curved cabinet. I wish I could have studied it for a while. I was curious when they said they restored the paint to the 1888 appearance. I wonder if that’s when they added the stripe? I would have wanted to open it and see how they were using it, and see how spacious it was. Yeah, those pesky “don’t touch the exhibits” signs really dampen my spirits, too. Thanks. I was trying to get a better picture of that door, but between the tight curve and the railing, there wasn’t a good way to get it all in. I was trying to imagine having to go out there in a storm. Wow, this is amazing! My fave apart from some of the door-like windows in the lighthouse is that curved piece of furniture. How did they make the curved parts? Were they carved out of a solid piece, do you think, or turned or what? If you like lighthouses, look out for a British artist (now passed) called David Smith. I knew him for years and he did a series of paintings of Lighthouses. There are a few here https://artuk.org/discover/artists/smith-david-19201999 but much more colourful ones on other sites. I’m glad you like that Val. The curved sections of the panel doors would have been cut out of think stock, and likely they would have cut the top and bottom rail out of the same piece. The join (the groove and the detail that looks like molding) would have been cut with a special hand plane. I’ve seen these tools, I have a couple; they work well, but I can only imagine trying to keep it in the correct place on a curve. The curved panel was probably just bent, either with the help of steam or hot water. Thanks for the link. Great shots! The lighthouse keeper’s house looks so simple from the front and like an apartment building from the back! Why so many doors, I wonder, other than the fact that doors are nifty? Did they maybe have multiple keepers at the same time? That would kinda make sense. And you’re right: that curved cabinet is a wonderful piece! Thanks! They did have multiple keepers living there, so it was a bit of an apartment building. This was an amazing collection with more than enough doors for two months! Packed into one Thursday’s Doors post. I sure did like the Gordon Lightfoot song, with same name. I checked it was written in 1976. Maybe I can screen shot some of those digital camera photos. . .
That’s a lot of light houses. Cheryl says there is a nice lighthouse in Daytona Beach, maybe that’s the one you visited.I do love that curved cabinet. I’ll trust anybody’s color choice over mine. I’ve always liked that song. There was a documentary on that ship on PBS last year, well, I saw it last year. I will have to look this up in my photo albums which although seems like “just yesterday,” it may be as many as sixteen to twenty years ago! Speaking of PBS, I read an article about a reality show on that broadcast where people are placed in slum settings like during Charles Dickens era. I would not enjoy this but “Mercy Street” may still be the one new show I liked. I think you’re right about the timing of that PBS special and the new show. We liked a rather dark cowboy type of police movie, “Come Hell or High Water,” (Jeff Bridges) watched with Randy and my Mom. We talked about Maverick, Rawhide, Bonanza and Guns of Will Sonnet, John Wayne, Gary Cooper, plus more. Then we thought of how some time periods are ones “worth coming back to.” I’m sure there are a couple of Western shows everyone remembers with fondness. Oops, my eyes thought it was navy and white cabinet, but I trust Deborah and will retract blue and make it “black and white,” Dan. . .
Lighthouses are great to see and each are unique as well as the coastal areas they protect. I visited the Pigeon Point Lighthouse along our CA coast and learned a bit about their Fresnel Lens (mainly how to pronunce it) and how they took it down and have it on public display (they use a LED lens now). The staff also told me that the timing of each lighthouse’s beacon is unique and identifies which lighthouse the ships are looking at. I enjoyed you post and might go archiving to see some my old lighthouse photos someday. No doubt, you found some great doors here! I didn’t know about the timing. That’s pretty cool. I guess it would be helpful to know what lighthouse you are looking at. I find stuff like that amazing. We are so impressed with modern technology, but there’s an example of a simple yet clever way to solve a big problem. Thanks for adding that! I hope to get back and to be able to tour the fort. I enjoyed your photos. Excellent post Dan. Who doesn’t love a well-maintained lighthouse? It’s nice to see how well it is kept; lot’s of history in that place. if I ever make it out that way, this is exactly the kind of place I’d want to explore. I’m glad you liked this, Norm. It was fun to explore. The city of Saint Augustine is interesting to visit and the historic buildings are gorgeous. I have not visited the lighthouse when I was there last time. But your photos make me want to. Beautiful. I hope to get back for another meeting when I can tour a little more. I only had an hour or so, and this worked well.